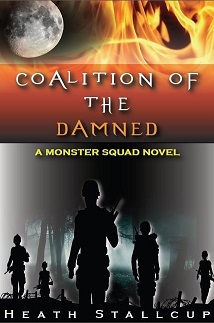 As the title to this blog entry suggests, the countdown to the release of MS3, Coalition of the Damned, has begun. While I don’t have an exact date, it should be about a week (give or take) for the third installment to be released to the masses. This release will be a little bit different than the previous Monster Squad books. This time we plan to include a peek at an upcoming release. We’ll be including a chapter from Caldera, my first novel delving in the zombie genre. These aren’t your typical Romero style, slow moving, mindless munchers either. These are the viral infected, fast moving, eat-anything-that-moves, rage type. Pulling a chapter from early in the book, I’m hoping it will tempt you to take a chance on what I hope will become my next series. Although Caldera was planned to be a stand alone novel without follow-up, I’ve been convinced otherwise by my beta readers and my missus. As the release date draws closer, you know I’ll let you know. And once it is ‘set in stone’, I’ll announce it. Until then, keep believing, keep reading and keep checking under the bed. And lucky me…I just finished the edits and got to read it already…this is some GOOD stuff.